In Jesus Calling, “Jesus” promotes the experience of his presence above God’s Word. Because God has magnified His Word above His name, this lets us know we will never experience His presence in any way that is not totally consistent with the truth of His Word. Thus, we can know that any presence that comes calling and claims the name of “Jesus” as its own but does not line up in every way with God’s Word is not the presence of God. God will never put His name or experiencing His presence above His Word. 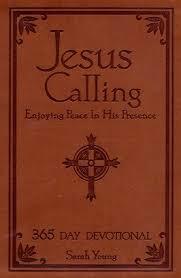 The presence that came calling on Sarah Young is extending an invitation to the readers of Jesus Calling to experience his presence as well—an invitation that is depicted in the book cover’s inviting hand. Keep in mind that another invitation is also taking place. If we choose to sit “with pen in hand” waiting to hear “more” than God’s inspired Holy Word, we, too, have an inviting hand. But what presence are we actually inviting into our lives? If one becomes dependent on a subjective presence rather than the objective Holy Bible, deception is inevitable. That is why it is crucial to compare what is taught by anyone or anything to the revealing light of God’s Word. Test the spirits of any presence that may appear in your devotions and quiet times. 1. Sarah Young, Jesus Calling: Enjoying Peace in His Presence (Nashville, TN: Thomas Nelson, 2004), p. 234. 8. Two Listeners; Edited by A. J. Russell, God Calling (Grand Rapids, MI: A Spire Book published by Jove Publications Inc., for Fleming H. Revell, 2005), p. 43. 10. Sarah Young, Jesus Calling, op. cit., p. 314. 12. Sarah Young, Jesus Calling, op. cit., pp. XI-XII.